In U.S. District Court in Phoenix, Arizona, a jury returned a $13.2 million verdict for grief and loss of love to the parents of a man killed when his car slammed into an overturned tractor-trailer on Interstate 10, according to attorney Michael Leizerman. Dwarfing a trucking company's pretrial offer of $625,000, an Arizona jury returned a combined verdict of over $13.2 million to the parents of a man killed in a 2008 accident in Ahwatukee, AZ. (Bachrach v. Covenant Transportation, U.S. District Court, Arizona, Case No. 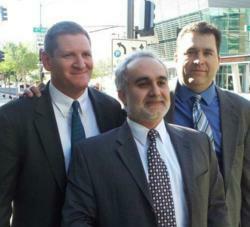 10-CV-0031) The verdict, which came down on March 13, 2012, is one of the largest U.S. verdicts in a consortium case. Consortium claims compensate loss of love, affection and companionship, along with the grief and shock experienced following the accident. They are not for economic loss. According to stipulated facts filed with the court, Matthew Bachrach, 31, was killed on September 7, 2008 when his car struck an overturned Covenant Transport tractor trailer on Interstate 10 in the middle of the night. Bachrach was forced to slam into the tractor-trailer, and was killed instantly. At the heart of the claim was that Covenant's negligence destroyed not only the relationship between Carrie Bachrach and her son, but also any opportunity for Randolph Bachrach to rebuild a relationship with his son. "The fair and reasonable verdict in this case was a very large number, given the close relationship between mother and adult son. The father's verdict represents his lost opportunity to reconnect with so before his unnatural and untimely death," says Michael Leizerman. The trial lasted a day and a half. The jury deliberated for three hours before delivering its verdict. The case marks the latest success for Ohio-based Michael Leizerman, of E.J. Leizerman and Associates, who focuses his law practice on injuries and deaths resulting from tractor trailer collisions. Two weeks earlier, he received the country’s first punitive damages verdict in a truck broker negligent hiring case. Leizerman runs the website TruckAccidents.com. Christopher Stombaugh has tried numerous cases resulting in record setting verdicts in Wisconsin and Iowa. He had the largest verdict for personal injury settlement in Iowa in 2009 and a record wrongful death jury verdict there in 2011. He also received the second largest “stray voltage” verdict in U.S. History. Chicago-based Ken Levinson, of the law firm Joseph, Lichtestein & Levinson, is known for his results in child injury and death cases. He is a frequent invited speaker who educates other attorneys on how to best handle child injury and wrongful death cases. He maintains a child safety advocacy blog at TheSafestLine.com. Leizerman, Stombaugh and Levinson each handle cases nationwide. This is their first collaboration. They look forward to joining efforts in the future to help maximize their clients’ results. You can follow Michael Leizerman on Twitter @TruckAttorney. Ken Levinson in on Twitter @TheSafestLine.